Spring is just around the corner, and maybe we’ll get some weekends without any rain spoiling the Single Guy’s plans. 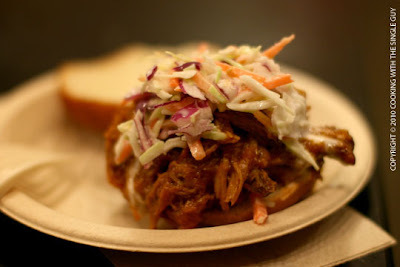 If the weather holds up (or even if it doesn’t) here are some fun food events to check out. March 2, Tuesday: Sakes of the South. Sake, the Japanese rice wine, takes center stage at La Mar Peruvian Cebicheria in the Embarcadero area of San Francisco. 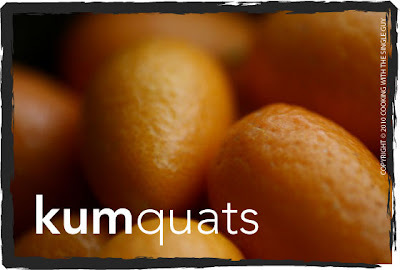 What dose sake have to do with Peruvian cuisine? Well, some of you probably know that country has a long history of Japanese immigrants, which is why some of the food has hints of Japan. So it’s fitting that sake is a regular accompaniment to Peruvian food. La Mar has gathered 39 sakes from the southern tip of Japan and will offer a tasting from 6 to 8 p.m. for $39 (includes tax and tip). Limited seating so might be a good idea to buy your ticket in advance here or call Pua at 808.222.0195. Pier 1.5 in San Francisco, just north of the Ferry Building. March 8, 22, April 5, and 19: Wine Varietals Series at 18 Reasons. The Mission neighborhood food community space is offering a four-part wine series featuring Foreign Cinema wine director Zach Pace. 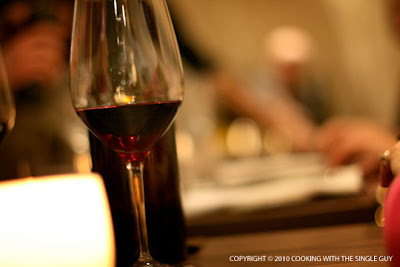 You’ll learn about specific varietals and growing regions such as Pinot Noir and Cabernet, and each class will feature six wines (which I’m assuming you can taste). Cost is $50 per class. There’s a different ticket purchasing link for each class, so the best place to start is the group’s events calendar for more information. 593 Guerrero St. at 18th, San Francisco. March 20, Saturday: Ferry Building Asparagus Festival. Sure sign spring is here when you see these green stalks at the farmers market. CUESA will make a day of it celebrating the asparagus at the weekly Saturday farmers market, cooking demonstrations and other events. For more information, go to the CUESA’s Web site. Free. 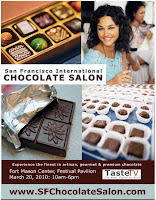 March 20, Saturday: San Francisco International Chocolate Salon. The annual chocolate hording fest is back at San Francisco’s Fort Mason Center, Festival Pavilion. 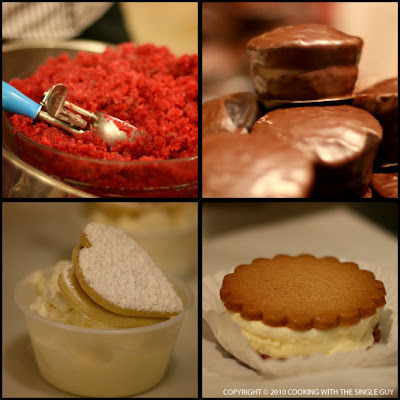 Tons of chocolatiers will show-off their new chocolates along with demonstrations and talks. This is always a huge event that runs all day but I suggest you get there early. Tickets are $25 (advance) and $30 at the door and can be purchased here. March 22, Monday: East Bay Bean Tour by CUESA. This special tour takes you to the East Bay’s two new production plants churning out organic tofu at Hodo Soy Beanery and specially roasted coffee at the cult-favorite Blue Bottle Coffee Co. (I already toured the Hodo Soy Beanery, which you can check out here.) Tour gives a look at the new factories and equipments, and concludes with a lunch at the Jack London Square farmers market in Oakland. Cost: $25 (includes lunch). Go here to purchase tickets. March 24, Wednesday: Book signing for “The Tablehopper’s Guide to Dining and Drinking in San Francisco: Find the Right Spot for Every Occasion.” Giving the Michelin and Zagat guides a run for their money, local know-all of the dining scene, food writer and blogger Marcia Gagliardi aka The Tablehopper will sign copies of her first book at Omnivore Books in Noe Valley. Event is free (but I’m sure you have to pay for the book — mama’s got to pay for dinner, you know!) from 6 to 7 p.m. 3885a Cesar Chavez St., San Francisco. For more information call 415.282.4712. 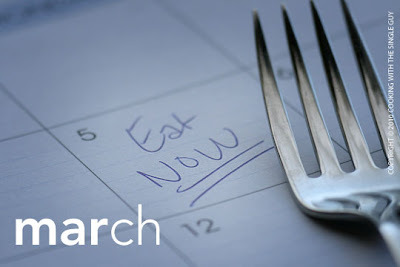 March 29, Monday: Café Rouge Butchers Series: Goat. OK, enough about the pig. Have you ever wondered how to butcher a goat? I’m sure you have. Now you can find out at Café Rouge’s monthly butchers classes. Café Rouge is the Berkeley restaurant with an excellent butcher shop in the back, so you know these people know their meat. For this month, featured speaker is Jeanne McCormack, sheep and goat rancher in Rio Vista. Class runs from 6:30 to 9 p.m. at the restaurant and cost $65. (Class size is limited.) To reserve a spot, call the restaurant at 510.525.1440 or go to OpenTable.com. For more information, visit here. 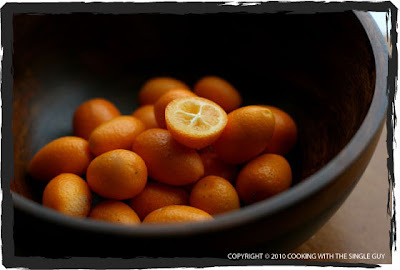 I don't know why, but I was mesmerized by the brilliant orange color of these tiny kumquats at the farmers market. But really when you think about it, that orange wouldn't look as spectacular if it was blown up to the size of, say, an orange. Then it looks normal. I have to thank you readers for thinking so much about my health. I mean, how else can I explain the last two selections for my Test Kitchen project, where I cook recipes from the pages of Food and Wine magazine? But you’re the boss, so off I went with my shopping list and since this was vegetarian I was able to get most of the fresh ingredients from my farmers market. 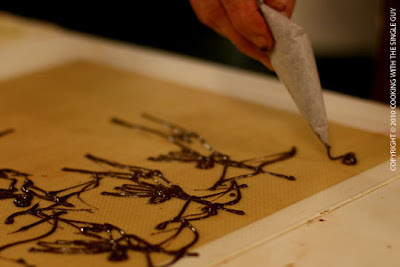 As always, you can get the complete recipe from Food and Wine’s Web site here. I started off by prepping the vegetables, which were the stars of this chili. The main vegetables were red bell pepper, parsnips and carrots — all at their peak this season. (Well, except the bell pepper, which you can get all the time.) Other things going into the chili came mostly from the can, including hominy and peeled Italian tomatoes. 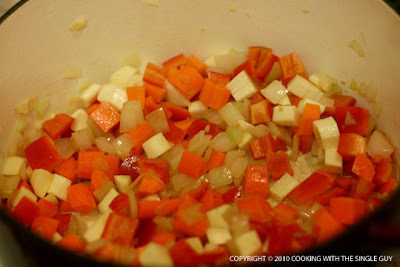 In my Dutch oven, I started off by sweating the onions and garlic and then added in the three main vegetables. After they browned a bit, I added in the chili powder and ground cumin (the heat allows the spices to release their flavors). This is also a good time to season the vegetables with some salt. So basically I dumped the entire can of chipotle and the sauce in with the tomatoes. The can was one of those small cans, I think maybe 6 ounces or something like that. I dumped the puree into the pot along with the hominy and some water. The recipe also says to throw in the kidney beans at this time, but I don’t like to have super soft beans since I just use canned kidney beans, so I added this near the end. I let the pot of chili cook for 20 minutes like the recipe said until the vegetables were tender. When the chili is done, you can taste it to add more seasoning if needed. But if some of you are familiar with using canned chipotle peppers, then you know that my chili turned out to be a four-alarm fire-hot chili, so even tasting it to see if it needed seasoning was traumatic for me. Needless to say, I spent the night sweating as I ate just half a bowl of chili, and I cursed Food and Wine for putting on a recipe that was so fiery hot without a warning. Then a few days later, I checked the recipe again, my mouth still burning mad, and read carefully that I really only needed to add one chipotle pepper from the can and not the entire can. ARGH!!%A@$!!@! Anywho, here’s how my chili turned out. It looks so harmless in a photo when you can’t taste it. The recipe says to serve it with red onions, sour cream, cilantro and chips. Again, I hate it when they tell you to use so many garnishes. I skipped the red onions because I’m not such a fan of onions, and also the sour cream because of my cholesterol. I ate the chili with sweetened iced tea, which really helped a lot. Read the ingredient list carefully. When they say “canned chipotle” they mean one chipotle from a can, not one entire can. 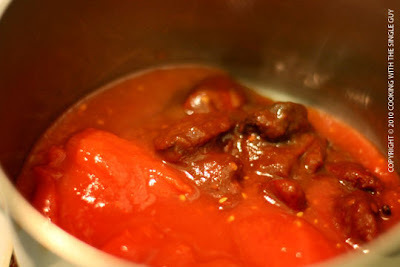 If you like your chili super spicy, then you can add more heat by either adding another chipotle pepper or using more of the adobo sauce from the can. If you use canned beans like I did, you might want to add them to the pot about 10 minutes before the vegetables are ready so that you don’t have really mushy beans. This really is a nice base for regular chili with meat, so you can add the ground beef or pork after you sweat the onions and before you add the vegetables. Ease of cooking: Other than the prepping of the vegetables and pureeing the tomatoes and chipotle, making chili is super easy since all you really do is sauté your ingredients and then let them simmer together to blend all their flavors together. The steps are fairly simple to follow along and you end up making a nice pot of chili that you can use for lunch and dinner for a few days during the week. Taste: After I realized my error in reading the poorly written Food and Wine recipe, I made a second pot of the chili. (I ended up using some leftover ground lamb I had in my freezer just because I wanted to use it up.) The overall taste of the chili was better, and not as traumatically hot. In fact, it almost tasted bland. 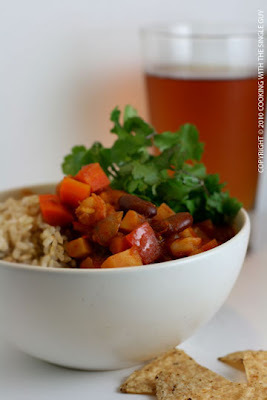 In the end, I did like the vegetable base of this recipe and it was really simple, and the flavors tasted better (like most chili and stews) after it sat in the refrigerator for a day. Don’t forget to vote in the poll on the upper right hand column to see which recipe I should be testing next from the March edition of Food and Wine. By then I think my tongue should have healed and I should have my taste buds back! Chef/Owner Melissa Perello just can’t seem to shake her fine-dining background. The young chef, who has helmed the kitchens of remarkable restaurants such as Charles Nob Hill and the Fifth Floor, has opened what is intended to be a casual family neighborhood restaurant in the city’s Castro district. 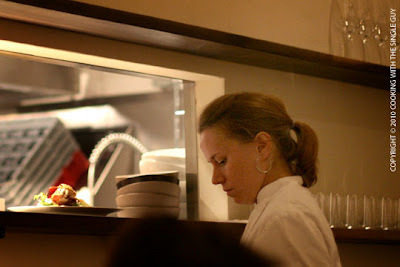 But the French-influenced dishes that come out of the kitchen of her new Frances restaurant – named after her grandmother – are far from casual. 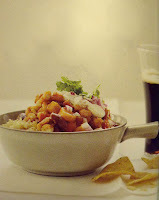 While they aspire to be simple and comforting, the dishes are beautifully plated and tantalizing to the taste buds. This highly anticipated restaurant, which opened late last year, has garnered so much praise and attention that it’s nearly deafening. 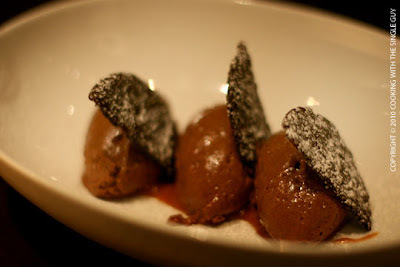 In fact, just last week Frances was named a semi-finalist in the Best New Restaurant category for the prestigious James Beard Awards for 2010. The restaurant in the heart of the residential area of the Castro was once the home of a Hawaiian eatery and briefly a Filipino-fusion restaurant. The space isn’t very large, and that’s the first complaint you’ll probably hear about Frances. The tables along the wall are squeezed to get maximum seating and people waiting for a table crowd the tiny front area in what is probably a bar if you can see past the gathering. The décor is contemporary and warm, with a high-end touch that gets a bit of whimsy from the funky letterings Frances uses for its signage and imprint on its daily changing menu. The menu reflects the California trend of sustainable and market-driven dishes, and Chef Perello has designed it with an interesting starter category called bouchées – five small plates each priced at $6.50. Since I skipped the fritters, I ordered the Crisp Pork Trotters for myself (Ken’s seafood-vegetarian so I knew he wouldn’t touch this.) I couldn’t remember which part of the pig the trotters came from (I later found out it’s part of the feet) but I remember having them at other restaurants and they were always crunchy and fun to eat. 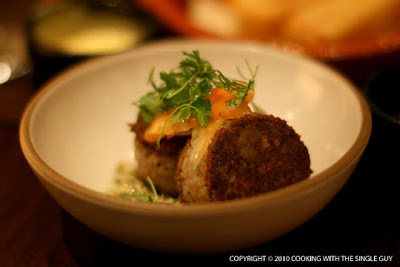 At Frances, the pork trotters was served like a crab cake, with the trotter formed into a disc and then pan-fried and served with a gribiche sauce and pickled baby vegetables. The plating was so beautiful (as was the tiny bowl) but I felt the trotter cakes didn’t really showcase the pig. While it tasted fine, to me it didn’t remind me of pork. Cute though. We could have gotten a few other bouchées but instead wandered into the appetizer section that featured a soup, salad and gnocchi (and one other item). Ken went for the Roasted Parsnip Soup ($8), which was a smart choice because a lot of the early buzz has been for Perello’s seasonal soups. 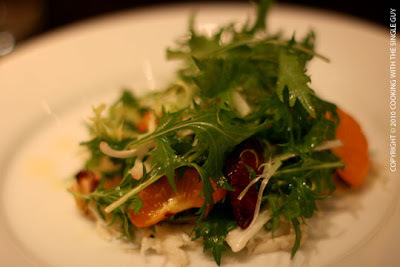 I ordered the Local Dungeness Crab Salad with winter citrus and Star Route mizuna ($12). 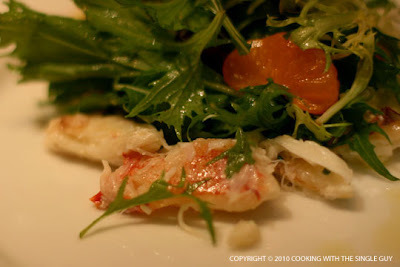 I knew that this simple salad of greens and citrus would be light because it has to be in order to showcase the subtle sweetness of the season’s Dungeness crab, and this salad delivered. 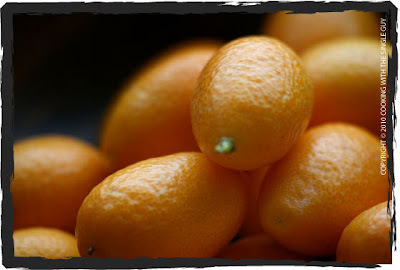 The salad looked refreshing and elegant, with a variety of citrus from blood oranges to an unusually orange citrus that was almost like kumquat in thickness and color but was too sweet to be kumquat. 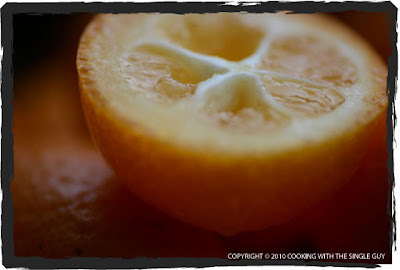 I appreciated the variety of interesting citrus selected to blend with the rest of the salad. I had to uncover the mizuna to reveal the crab meat that was all hidden underneath. Even though it was hidden, there was no denying the crab was the star. The crab was cooked perfectly, tender and lightly seasoned to bring out the natural sweetness of the crab. The restraint in this dish is the true genius in serving crab because the natural flavor is so delicate that any kind of sauce would overpower it. So while this was a simple salad, it was also a “delightful” choice for me. 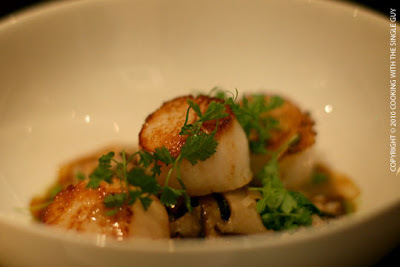 Moving to our entrees, Ken ordered the Caramelized Atlantic Scallops ($22). 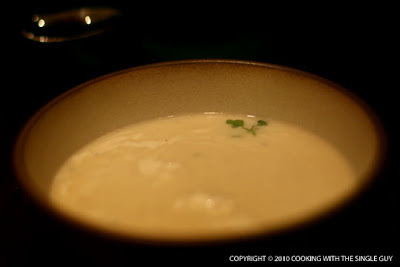 We debated for a bit on how many scallops he would get because while we both love scallops, restaurants often give you just a few pieces despite the high cost. I guessed three, and I was right. The three seared scallops laid across a pile of toasted farro, fava greens and wild mushrooms. I’ve read others who felt what is offered in this dish is small for the $22 price tag, but Ken said the scallops were cooked perfectly and the hearty farro made the dish feel more substantial. I ordered the Sonoma Duck Breast ($25) because you know my rule about seeing duck on the menu. The slices of almost rear duck breast were served with Contechino sausages that added a nice savory flavor. 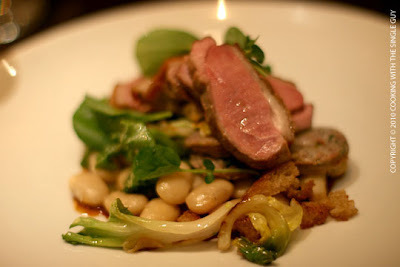 The duck also sat on a butter bean ragout (everyone seems to be serving beans these days) with sautéed escarole. Everything on the dish was cooked nicely, and I enjoyed the sauce that pulled it all together. What was also interesting for contrasting texture was what seemed like bits of croutons sprinkled on top that added a surprising crunch now and then. Side note: Chef Perello can be seen at the window looking into the kitchen. She spent the night in the expeditor role, making sure dishes coming out from the kitchen looked perfectly plated and got to the right tables. I think it says a lot about the kitchen staff when the executive chef’s menu is executed so well without her in the kitchen. We neared the end of our meal and as Ken and I looked over the dessert options, there weren’t anything that intrigued me. My rule with dessert is to go for something I probably can’t get anywhere else. So that means I generally skip the chocolate cakes or crème brulee options unless they’re made with a unique ingredient. I haven’t written much about the wine selection at Frances because both Ken and I skipped drinking (I’m still on my wine cleanse). But Frances has a top-notch sommelier in Paul Einbund, formerly of the two Michelin-star Coi. Along with developing a strong list of wine, Einbund has created a house blend of red and white that’s sold for $1 per ounce. So you get a decanter of wine at the table and the server deducts how much you’ve drank to determine your total cost. With most hyped new restaurants in town, high expectations can dampen the experience because who can really live up to such standards. 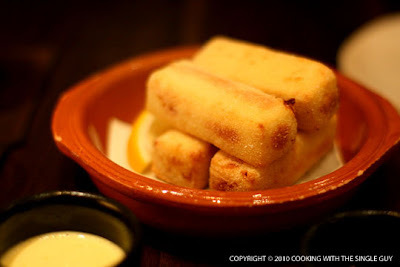 But at Frances with the talents of the kitchen headed by Perello, this is one overly hyped restaurant that rises to the occasion and meets the expectations head on. 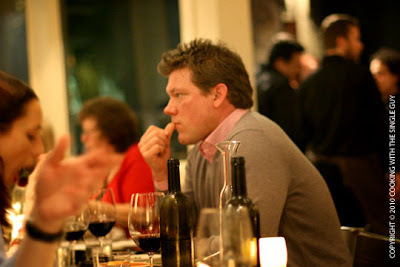 After I was seated at my table at Frances, out of the corner of my eye I noticed Food Network Chef and Marin resident Tyler Florence in the house enjoying dinner with two others. Given Florence’s busy schedule (he’s developing three restaurants and expanding his retail empire with his stores and organic baby food line), I was surprised to see him having dinner out. 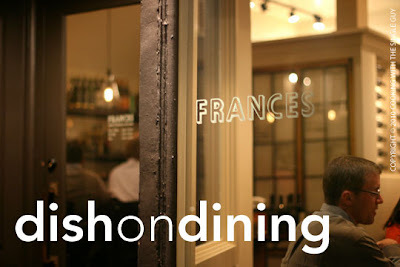 But it says a lot about the buzz surrounding Frances that it’s become a destination restaurant for the Castro neighborhood (one the neighborhood has been needing for a long time). Technical note: To all you camera nerds, this is the first restaurant review that all the photos were taken with my Canon DSLR Rebel camera using my new Canon EF 50mm fixed f/1.4 lens. I got this lens as a Christmas gift, and I’ve been testing using it out at restaurants. I love the photos I get in well-lit restaurants serving up small portions (the lens take really close up shots so it’s difficult to capture a large plate unless I back up a lot). I don’t know how often I’ll use my big DSLR camera because it’s still a bit awkward to be holding up the camera and taking pictures in a restaurant. I’ll probably use it for restaurants that have an open layout (where the room is big and people won’t notice me as much) and when I’m dining alone (I can pretend to be playing with my camera) so I’m not embarrassing my dining partner. So most of my reviews will probably still use photos from my point-and-shoot Fuji. See if you can tell the difference. This morning I was at the Berkeley Farmers Market and spotted these beautiful spheres of vegetables. 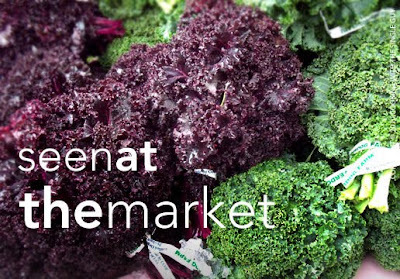 With the deep winter colors of purple and green, this is curly kale. Now, I'm not a big consumer of kale, curly or straight, but I just thought these curly kale balls looked so interesting. I'm sure they're probably good for hearty soups or braised anything. But when I look at them, I keep getting the feeling that the Barefoot Contessa would make table centerpieces out of them. Don'tcha think? Open Tue.–Thu., 7 a.m.–8 p.m.; Fri.–Sat., 7 a.m.–10 p.m.
How can you not like a place where the star attraction is called the “piggly wiggly?” Come on, how cute is that? 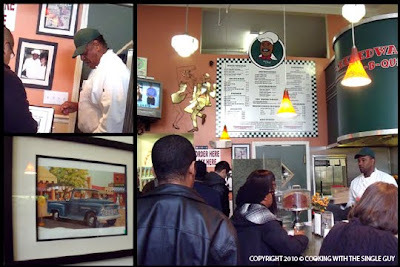 When I read James’ post about his latest eating adventure during a trip home to the East Bay, I realized that the legendary piggly wiggly sandwich is served up at Chef Edwards Bar-B-Que just a few blocks from my Oakland offices. So I recruited my friend and co-worker Sue and we both made the trek to the other side of Uptown — passed a new condo complex — for a taste of the piggly wiggly. Chef Edwards is Earl Edwards, who opened his BBQ joint on San Pablo Avenue in 1998. About four years ago, he moved his tiny BBQ stand (presumably to make room for the new condo) across the street to his current location. The new location is still a bit small and is packed for lunch. The décor is a bit diner motif with a splash of Americana in the novelty items along the ceiling and framed watercolors of classic old cars. 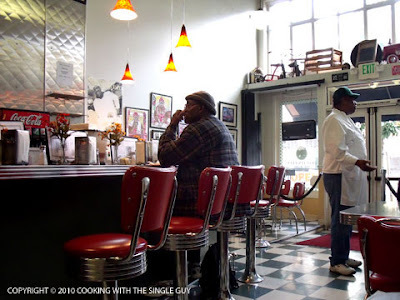 A large counter with stools take up the center of the room, and towards the back is Chef Edwards himself manning the cash register. 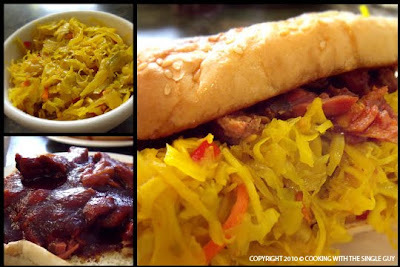 It took awhile for our sandwiches to arrive, but when it did it looked like a big open-faced sandwich with the pork pieces drowning in sauce. There was no way you could pick this sandwich up and eat it. Along with the sandwich was the coleslaw, which was a bright yellow that made Sue and I think it came from some kind of crazy Crayola factory. I placed a bit of the coleslaw on top of my sandwich to at least make it look like a pulled pork BBQ sandwich. But I still had to use my fork to eat it. Sue said the BBQ was the best she’s ever had (or at least I think she said it was one of the best) because she really could taste the smoky flavor. I agreed that even drowned in the sauce, you could tell the meat itself was carefully smoked to perfection. The cole slaw wasn’t bad, either, adding a nice crunch to the overall sandwich. My only issue was that the sweet-tangy BBQ sauce is the type of sauce that tastes really good at the first bite but a bit overwhelming after the 10th. The sugar level may have been too much for me because I felt like I had a stomach ache near the end of lunch. Still, the BBQ was so intriguing and Chef Edwards was so personable (like you’d expect from any BBQ master from the South) that I decided to return for dinner on a Saturday night. I sat at the counter, watching the endless football games on the TV set above, while I also tried to decide what BBQ to order. I was tempted to get one of the combinations (ranging from two to four choices from $13.99 to $19.99) until I read the disclaimer on the menu. When ordering the combos, you can’t choose the baby back ribs, turkey wings or chicken wings. Since I love baby back ribs (I could have gone with the pork ribs instead) I decided not to go with the combo dinner and instead got a plate of the Baby Back Ribs ($12.49). I don’t know if it’s always served this way, but my plate of ribs came drowned in sauce. I should have asked that it be served on the side because I’m sure the ribs are just as good without the sauce on top. Still, I devoured them because they were so tender and tasty. 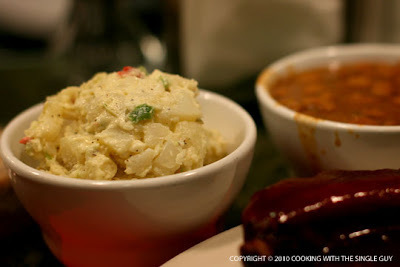 The potato salad felt like a summer picnic, with a variety of ingredients to give it a complex but comforting flavor. I appreciated that it was balanced and not gloopy like some other places. When eating the beans, you could tell this was made from some family recipe with the beans probably cooked for hours in some kind of pork fat. 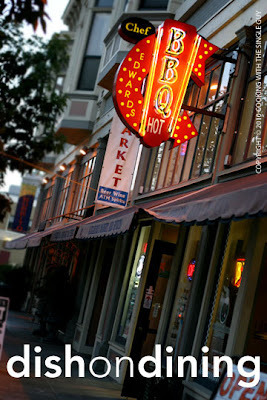 Still, Chef Edwards serves up some of the best BBQ around town. 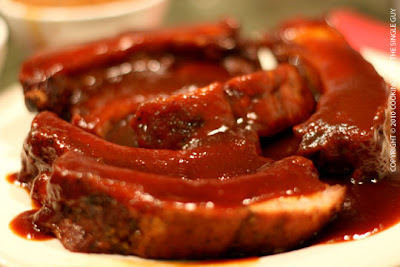 Fresh meat tenderly cooked all day are served up warm and with some comforting southern sides. The service can be slow at times, but the gentile Southern charm more than makes up for it. 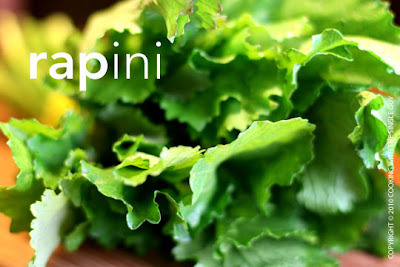 If you grew up in an Italian family and your mom told you to eat your greens, my money is on the fact that it was probably rapini that made it to the table. 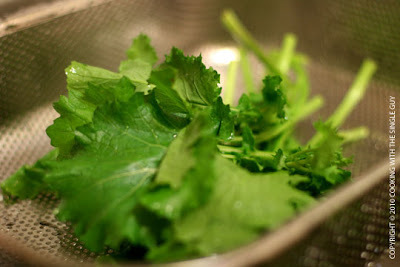 Since I’m not Italian, I didn’t grow up with this hearty green, also known as broccoli rabe. But I see it a lot on the menu of Italian restaurants. It’s funny that it’s sometimes called broccoli rabe because it doesn’t remind me of broccoli at all, except for maybe the stalks, which has the same texture as broccoli, but it definitely doesn’t look like it. It actually reminds me a lot of choy sum, which ironically is called Chinese broccoli. Wait, maybe they’re all related?! Anywho, I saw fresh rapini for sale at my local farmers market recently so I decided to cook with it for the first time. I made a simple pasta dish, throwing in some yellow Yukon potatoes that I also found at the market. Yukon potatoes are really creamy, and the ones I bought were baby potatoes so they were so cute I decided to throw them in after roasting them. You don’t have to roast the potatoes, but I have a thing for roasted potatoes so whenever I can mix in potatoes to a dish, I will. 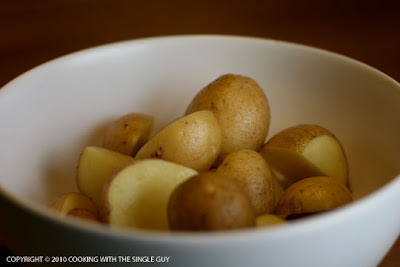 So actually this is a great dish to make whenever you have leftover roasted potatoes. Just toss them with rapini and some pancetta and you’ve got yourself a meal. Enjoy! In a pot, boil water and add salt to cook your pappardelle per packaging. Drain and set aside, but reserve about a half a cup of the pasta water. Toss potatoes in some olive oil and season with salt and pepper, then spread out on roasting pan or oven-safe baking dish and place in oven until soft, about 25-30 minutes. When done, set aside. In a sauté pan, cook the pancetta over medium high heat to render out the fat. About 2-3 minutes. 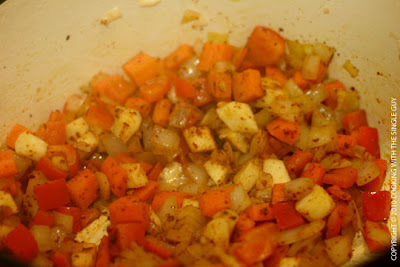 Then add the shallot and reduce heat to medium and cook until translucent, about 2-3 minutes. Throw in the rapini and add about 1/4 cup of the pasta water to help soften the rapini. (Watch your heat, you may need to turn it up a bit to create a steaming effect. 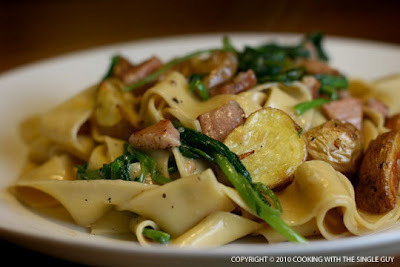 )When the rapini looks cooked, toss in the pappardelle and the roasted potatoes. (Add more pasta water if needed.) 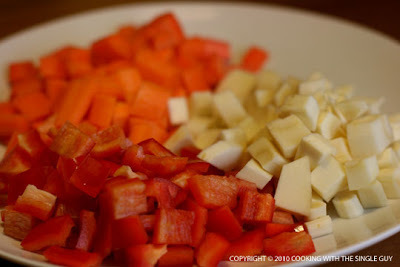 Remove from heat and toss in the pecorino cheese. Plate your pasta and finish with a drizzle of high-quality extra virgin olive oil. Serve with toasted bread. TIP: You can use leftover roasted potatoes for this recipe. Just bring it out of the refrigerator to let it come to room temperature before adding it to your pasta. 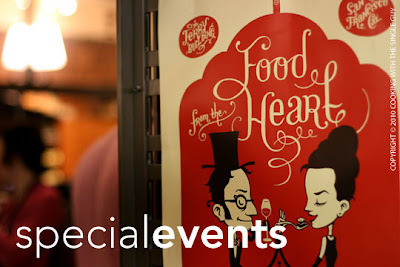 On Friday night, I went to the "Food From the Heart" event at the San Francisco Ferry Building, the seventh annual Valentine's themed event where the marketplace vendors set up booths and sell small bites for a good cause. Joining me was my friend Ken, who arrived there early and already got his glass to try some wine (the event partnered with Napa Valley Vintners). The event was only 30 minutes old and the entire Ferry Building already seemed crowded and I started feeling warm from all the people. I got myself some food tickets and Ken and I started checking out the offerings. The first thing we saw was the table from Il Cane Rosso, the specialty sandwich shop by Chefs Daniel Patterson and Lauren Kiino. 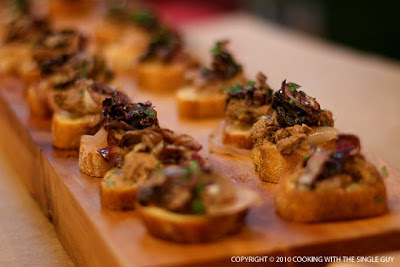 For the event they made these croistini with grilled radicchio and red onion. Ken tried one and liked it, but I passed because I'm not a fan of red onions. 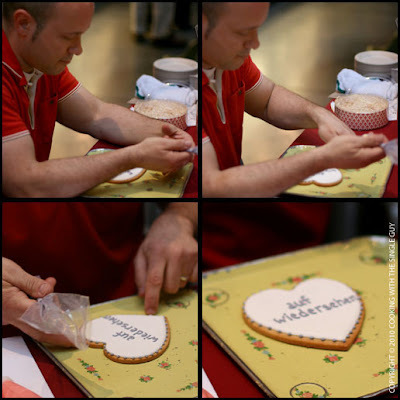 This guy was setup near the Miette Patisserie and was decorating personalized Valentines messages on cookie hearts. Here he must have been doing a cookie for either a "Project Runway" fan or someone who was actually breaking up with his/her Valentines because it says "auf wiedersehen." 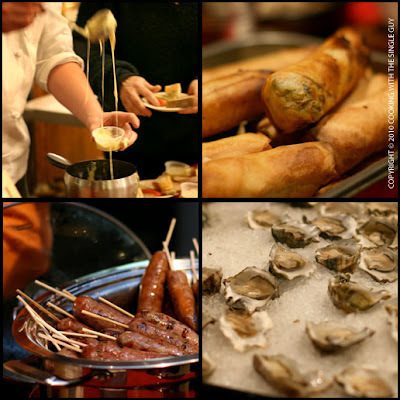 There were a whole bunch of food that I had to avoid because of my cholesterol, things like the cheese fondue at Cowgirl Cremery, huge deep-fried spring rolls at Imperial Tea Court, "sausage on the stick" from Golden Gate Meat Co., and fresh-shucked oysters at Hog Island Oyster Co. I also avoided the wine, not because I can't drink it but I'm on a drying spell after weeks of drinking. Just call it my wine cleanse. 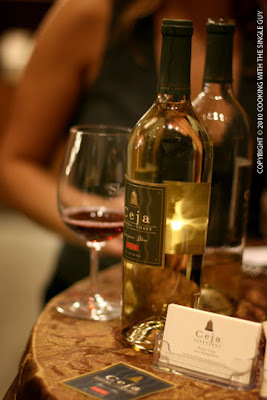 Ken tried a few wine, though, including a pinot noir from this family vineyard called Ceja in Napa Valley. OK, so what did I eat? 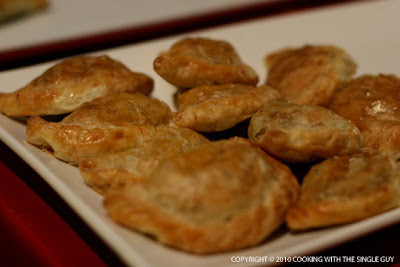 I started with these mushroom empanadas from Mijita. Some of you sharped eyed readers will probably say, "but Ben, they sure looked deep-fried." And I say, you are correct (and quite the perceptive reader). 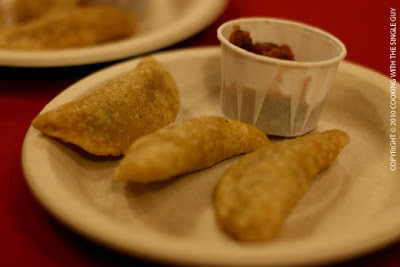 Ken was a bad influence and knew I love empanadas so he convinced me to try this if he ate the other two, which he did. So I really just had one deep-fried empanada. Unfortunately, they were a bit cold and soft, not as crispy as I thought it would be having been fried. Soon after I had that Mijita empanada, I ran into these baked beef empanadas from the El Porteno guys, who had a booth set up in front of the Prather Ranch Meat Co. To make up for the sad empanada I had a few minutes ago, I got one of these. And they were beefy, tasty, and flakey. I was happy again. Probably the best deal of the night, IMHO, were the small bites from Market Bar. 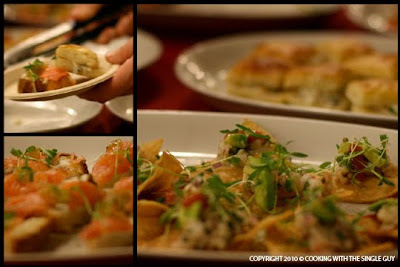 They were offering a plate with three bites: a smoked salmon croistini, a crab puff and a blue Hawaiian tuna ceviche on a tortilla chip. I enjoyed all of them, and was really impressed that the tortilla chip was still crispy. (I've had ceviche on chips that were soggy from the juices, but this was not.) Plus, everything looked so great. I was looking for something more substantial, and you can't get more substantial than a pulled pork sandwich. Here's the mini bun with cole slaw topping from Taylor's Refresher. It really hit the spot. 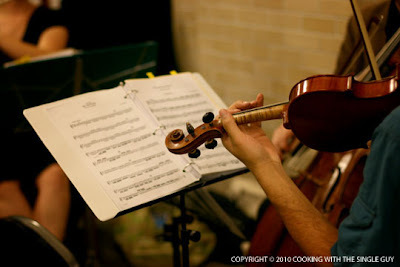 "Food From the Heart" is fun to explore the food, but it's also a fun evening at the Ferry Building because they set up a variety of musical groups adding a nice ambiance to the event, from jazz trios to blues to classical. And far on one end of the plaza, a group set up music and had people dancing the tango. 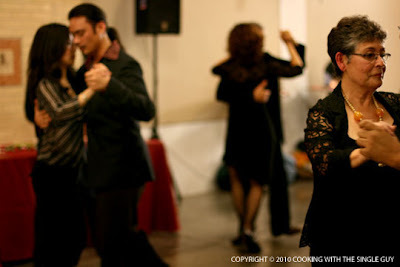 Just the scene reminded me of Buenos Aires, where tango dancing is often an impromptu event on the streets. How more romantic can you get than the tango, right? Of course, there were a lot of chocolate-related things, mostly from Recchiuti Confections, which had several stands and booths, including this where a guy was creating chocolate angels. Along with the chocolates, there were other sweet dessert offerings. There was a lovely blood orange granita from Frog Hollow Farm that was refreshing and very authentic, the "whoopie pie" from Recchiuti that is like a Hostess cupcake but the filling is made with rose-infused butter cream (I couldn't really taste the rose flavor because it was overpowered by the chocolate cake), and mushroom-infused flavored ice cream by Humphry Slocombe in front of the Far West Fungi shop (I couldn't get myself to try that), and a creme fraiche ice cream sandiwch from Miette (the ice cream was OK, but I really liked the graham cracker sandwich). After nibbling here and there, Ken and I decided to go get some food at the nearby La Mar. On our way there, we noticed these event glasses that someone left behind on the street light stands. The uplight made a nice reflection in the glass so I decided to snap the picture. 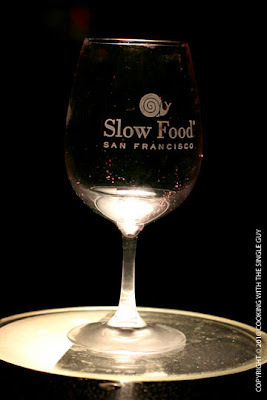 As you can see, the etched wine glass shows that the event was also a fund-raiser for Slow Food San Francisco. Walking around after the light rain, it was another classic beautiful night in the city. Hope you're all having a nice Valentines (and happy Chinese new year, too)!